Things are rocking and rolling in Youngstown OH due to the 4.3 magnitude earthquake that struck today, December 31st, just in time for New Years. My family did not feel the quake in New Castle PA, but my nephew in Youngstown did. He is a chef in one of the upscale restaurants. When I asked him about it he said that "It felt like a bomb went off". I asked him for pictures, expecting perhaps, a few broken plates. He sent me a picture of an oven door that opened up during the quake, don't laugh my Californian friends, a 4.0+ earthquake is a big deal in this part of the country. Some have been quick to blame the spat of recent earthquakes (today's being the largest) on shale-related drilling and a fluid-injection well in the area. While evidence indicates a relationship, a history lesson points out the earthquakes are not new to the region. A 1986, 4.8 magnitude earthquake should put to rest any conjecture that shale gas is the sole cause of any earthquake that occurs. I recommend that we we not jump to the conclusion that every earthquake in an area where there are injection wells must be the result of that injection activity. Earthquakes are not uncommon and they will continue with or without injection wells. Some areas may indeed be more prone to injection well activity causing a release of stress along fault planes beneath the surface of the earth. In addition, it is important to understand that the "potential energy" is already there. Rock structures on either side of an active fault are already under stress and will fail or slip at some point. Are injection wells inducing slip that would have been more severe if nature stored up even more potential energy before a natural release? Or are injection wells inducing slip all at once as opposed to nature releasing the energy more slowly over time? More study needs to be done and the answer likely varies from location to location. The Utica Shale, thousands of feet below the Marcellus, remains a bit of a mystery. Operators are only just now beginning to penetrate and produce from the Utica using horizontal drilling and hydraulic fracturing. The Utica is somewhat thinner and more widespread than the Marcellus and operators are scrambling to establish good drilling positions and gain an understanding of what the Utica Shale holds. All across Central and Eastern Ohio and Western Pennsylvania oil and gas companies are searching titles and going through the necessary steps to be ready to start the process of drilling. Some companies, like Chesapeake Energy, have already made significance progress in understanding the potential of the Utica Shale and many other companies are close on their heals. The depth of the Utica Shale is one aspect of this shale formation that requires special considerations. With the Utica Shale averaging 2,500 deeper than the Marcellus in many locations, drilling costs will be higher making economics a more important consideration. And like the Marcellus, thickness and depth of burial are important as well. Too shallow, less than 2,000 feet in depth for example, and the shale has likely not contained the gas or oil. Too thin, and the zone is not of sufficient thickness to produce hydrocarbon in sufficient quantities. What the Utica Shale has going for it in many areas is the propensity for producing "wet gas" and oil. "Wet gas" refers to the many petroleum derivatives like ethane and butane that bring a higher sales price. Economically, wet gas or oil are more highly desired in this era of comparatively depressed gas prices. BTU to BTU, oil is worth three times what gas is in the current environment so that will have oil and gas companies chasing the more "liquid plays" as long as those economics hold, and that is the case predicted out for the next few years at least. 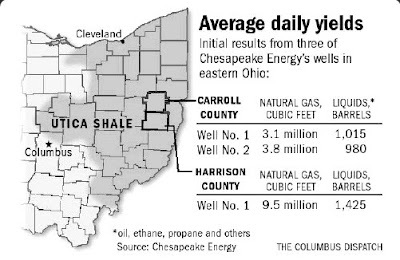 On September 20th the Ohio Oil & Gas Energy Education Program or OOGEEP released a study detailing the economic impact of the natural gas and crude oil industry on Ohio. The Utica Shale was cited as the driver of the increased economic activity. According to the report, the increased activity would help support or create 200,000 jobs, and a $12 billion wage and person income boost by 2015. The study also pointed that even in 2010 the oil and gas exploration related to the Utica Shale accounted for $793 million in salaries and personal income for Ohioans, $90 million in royalty payments to locals, and $32.7 million in taxes. 2011 to 2015 projections increase the numbers significantly. “The data clearly demonstrates the transformative force oil and gas exploration and development could have on the state’s economy,” said Rhonda Reda, executive director of OOGEEP. “Ohio has been given great geological gifts and the economic potential is tremendous. Chesapeake reported today that they have "achieved key production milestones" in Utica Shale. Aubrey McClendon stated that "We are pleased to announce very strong initial drilling results from wet gas and dry gas phases". The Utica Shale play appears to be poised for a long and profitable run, particularly in the wet gas area of the play given the ability of oil prices to be sustained at a relatively high (profitable) level, despite the downturn in the economy. More to come, surely.